Have you ever felt like it's hard to establish a relationship with your favourite blogger, no matter how open they are in their blog? Their world seems to be far away. You spent hours reading through their articles and feel like you kinda know them but you can't seem to take part in their current activities or let yourself be noticed by them? It's tiring visiting their blog every few days or checking their FB page just to see if they've posted something new? Wish to receive personal news directly in your morning mail? Or maybe you're completely happy with the blog as it is but would love to receive more stories/articles? I have great plans with you in 2013. The 3rd of every month will be our Secret Letters Day. Please look forward to this date! Sign up & get your first Secret Letter on January 3rd 2013. If you're not interested in the giveaway (^^?) you can just subscribe to 'Secret Letters' without commenting - in that case you won't be entered. 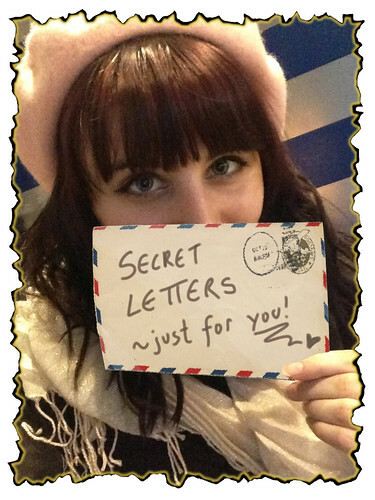 2) Comment below with a suggestion/idea on what you'd like to read in Laurita's Secret Letters. The 3 winners will be announced in your first Secret Letter!